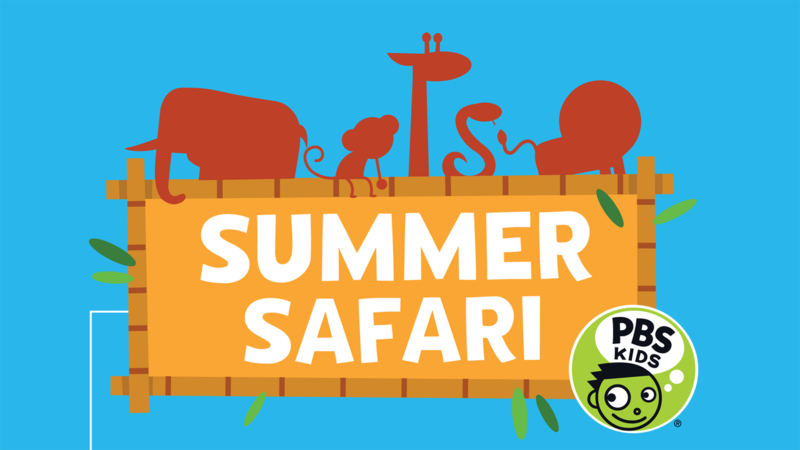 ARLINGTON, VA, June 9, 2015 – This summer, PBS KIDS is encouraging kids and their families to continue learning beyond the school year with a “Summer Safari” of content and activities. Developed to help bridge the summer learning gap, PBS KIDS’ Summer Safari includes specials and new episodes from DINOSAUR TRAIN, WILD KRATTS, CURIOUS GEORGE and WORDGIRL, free digital tools for parents and kids, and partnerships with AARP Foundation Experience Corps, I Can Read books published by Harper Collins Children’s Books, Reading Is Fundamental and National PTA that bring learning activities directly to communities. DINOSAUR TRAIN: Zeppelin Adventure: PBS KIDS Summer Safari kicks off in June with one-hour specials from DINOSAUR TRAIN every week, including the premiere of DINOSAUR TRAIN: Zeppelin Adventure on Monday, June 15. In this all-new one-hour special, the Pteranodon family takes off on the Dinosaur Train Zeppelin to explore the continent of Pangea. WILD KRATTS Wild Wednesdays: July is jam-packed with WILD KRATTS fun every Wednesday. The month kicks off on Wednesday, July 1, with the hit movie WILD KRATTS: Back in Creature Time. Two new episodes of WILD KRATTS premiere each of the following Wednesdays in July. In addition, “Rhino Bowl,” an online game from WILD KRATTS, debuts this summer at pbskids.org. In this new mobile-friendly adventure, players must use rhinoceros-strength creature power to save the day. CURIOUS GEORGE 3: Back to the Jungle: On Monday, August 17, the hit 2009 movie CURIOUS GEORGE 2: FOLLOW THAT MONKEY is followed by the world television premiere of CURIOUS GEORGE 3: Back to the Jungle. In the movie, George goes on an epic adventure to space that crash lands in the jungles of Africa, leading to an unforgettable journey with some new animal friends. WORDGIRL: This summer, WORDGIRL flies onto screens from coast-to-coast and flexes her crime-solving muscles in 20 never-before-seen episodes on PBS KIDS digital platforms, including pbskids.org and the PBS KIDS Video App. Two episodes per week will premiere on air and on digital platforms. AARP Foundation: PBS KIDS has partnered with AARP Foundation Experience Corps to extend the learning from this summer’s new WORDGIRL episodes. Through this initiative, AARP Foundation Experience Corps tutors, PBS member stations and their local partners will provide WORDGIRL literacy activity booklets to children in kindergarten through third grade. The activities build on the literacy and vocabulary skills addressed in the new WORDGIRL episodes, which will premiere weekly this summer. Episodes and materials will be available online at youtube.com/pbskids and youtube.com/aarpexperiencecorps, as well as pbskids.org/learn. I Can Read! books published by HarperCollins Children’s Books: PBS KIDS and HarperCollins are offering free reading party kits for hosting an I Can Readathon event through participating retailers and PBS member stations. The kits include an I Can Read! activity booklet, reading logs, activity pages, stickers, certificates, a PBS KIDS Summer Safari activity chart and activity sheets. Reading Is Fundamental and National PTA: PBS KIDS is partnering Reading Is Fundamental and National PTA to encourage families to explore reading and learning through a variety of activities this summer. PBSKIDS.org/learn: PBS KIDS provides parents with daily learning tips, extended learning ideas and recommended games and activities now through August 30 at pbskids.org/learn. Free Apps: PBS KIDS offers a variety of free apps for parents and kids to support summer learning, including the PBS KIDS Super Vision App, now available on Apple Watch, and the popular PBS KIDS Video App. Information about the apps is available at pbskids.org/apps. Free PBS KIDS Videos: PBS KIDS will once again offer free episodes of favorite PBS KIDS series through iTunes this summer. PBS member stations across the country will be bringing PBS KIDS content to life in local communities to engage children ages 2-8 and their families in learning and fun. Local member stations will be partnering with organizations in their communities, including local libraries, schools, museums, social service agencies and more, to host hundreds of local events reaching hundreds of thousands of children and families and providing them with educational experiences, tools and resources. Parents can follow PBS KIDS on Twitter and Facebook for more information on free summer learning resources and special offers from PBS KIDS and its partners. Press materials related to PBS KIDS’ summer learning initiatives are available on PBS PressRoom.